A year that began with awkward questions has ended with an incredible and highly improbable one. Six points off the top on Saturday night, matching the form of the Continent’s heavyweights and very much on the march: are Newcastle United involved in the Premier League title conversation? Before the charges of delusion are prepared, that very poser was put to Alan Pardew by an independent, non-North East voice at Selhurst Park in the hour after United’s latest impressive away day display. He wanted none of it, of course, but the longer this formidable run snakes into the winter months the harder it will be to regard Newcastle as an anomaly in the top six. The weekend brought another 90 minutes where Newcastle looked like they belonged. The title? Let’s be honest, even in the festive party season no one is getting that tipsy on United’s success. This is not a squad built to challenge for those kind of honours. But the Champions League? With a bit of managerial sorcery, good fortune and the reliable eye of Graham Carr it is something they can reasonably shoot for in the New Year. How it has come to this is another matter entirely. Pardew did his best to tread the company line and paint a portrait of unity and cohesion at the highest levels at St James’ Park but in truth it is more the case that each of the key figures at the club has been able to re-establish themselves against a backdrop of success and positivity on the pitch. He would hardly be able to say anything else, of course. Even great results don’t buy you a critical voice at Mike Ashley’s Newcastle and the owner wants Kinnear’s role acknowledged and encouraged ahead of the transfer window. It sounds idiosyncratic – at the very least – but the form since Autumn has been nothing short of breathtaking. This is a coalition of convenience but the unwieldy nature of the powerlines at the club seems to matter less than the fact that most of the power brokers are pretty darned good at their jobs. On Saturday, two of Carr’s January picks, Moussa Sissoko and Mathieu Debuchy, looked unplayable dove-tailing down Newcastle’s right-hand side and the hope is that he has more cabs waiting to come off the rank next month to prompt further progress. For his part, Pardew deserves all the plaudits for re-discovering what was lost this year. Recapturing momentum is ten times harder than finding it and he has performed admirably since a first half at Goodison Park where his time in charge of the club looked like it was running out. For all that Newcastle looked in trouble that evening, they have performed with an assurance and authority ever since. Occasional bouts of carelessness – most notably at Sunderland – should not shroud the fact that a system, a style and a swagger have been discovered in an eight-game spell that has seen them accrue 19 points and pass a variety of examinations. On Saturday it was the ‘Wet Wednesday night at Stoke’ test for United’s new model army, with Stoke substituted for Crystal Palace now that Tony Pulis has transplanted his Potters philosophy to Selhurst Park. With rain lashing down and ferocious gales whipping Selhurst Park, Eurosceptics might have questioned Newcastle’s appetite for the fight. It was there in spades on Saturday and more pleasingly, so too was Newcastle’s determination to set the tone against one of the division’s bantamweights. At one point during the second half possession ticked around to 71%-29% in United’s favour, and they were not retaining the ball for the sake of it either. They were pressing, prompting and putting Palace on the back foot. The result? Their first three-goal haul of the campaign and the most comprehensive victory of it too. The disharmony in the dressing room has disappeared; replaced by a unity that is rooted in self-belief. On the back of beating Manchester United, Chelsea and Tottenham, Newcastle are now convinced that they can win anywhere. “I just think we’re in a good place as a club,” Pardew reflected afterwards. “I know we’ve some strange opinions about us from outside but we’re working well together. The owner is really pleased, I’m really pleased and the players are, more importantly. If the players aren’t happy, you can’t get those sort of performances. Back on friendly territory – the match-day programme contained a positive eulogy from Pardew’s former team-mate Mark Bright – United were always in control against opponents who look out of their depth at this level. As ever, it was a result that was forged by the midfield engine room. Cabaye was majestic while Sissoko and the excellent Debuchy were merciless against poor Dean Moxey, who was withdrawn at half time. 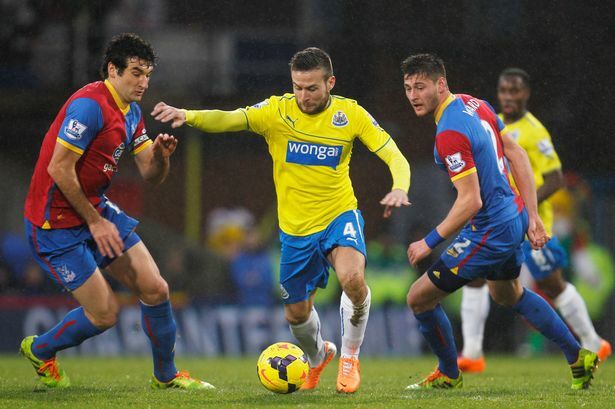 The opener came when Cabaye side-footed Debuchy’s cross past Julian Speroni via a Damian Delaney deflection. A harrassed Danny Gabbidon then slid another Debuchy cross past his own goalkeeper to hand Newcastle a commanding lead. That slight suspicion that United have a tendency to step off in second halves was disproved by 45 strong minutes that included a pleasing cameo from Hatem Ben Arfa, who swept home a penalty to put a cap on a result that tees Newcastle up nicely for their festive programme. Newcastle United have told fans forum a top-ten finish is only a "minimum requirement"